Hello everyone! My name is Heidi and I blog at Handmade Frenzy. I can be found most frequently hanging out on my IG page @heidi_handmadefrenzy. I am so thrilled to be here today and participate in the very first D&H Fabrics Co Blog Tour! A little bit about me; I am a wife, mom to three, and sew constantly. Or at least squeeze in as much sewing as my life allows! I started out sewing for my kiddos, but since my third child was born (who is now 3 1/2), the sewing has become mostly selfish. I never in my life dreamed I’d be sewing my own jeans and jackets, but here I am! In today’s project I stocked up big time on knit basics, because really, I just love sewing it ALL. When Tammy offered to send fabrics of choice for the tour, I was seriously stumped. I mean, have you seen her shop!? How on earth was I supposed to choose!? The more I pondered it, the more I realized that I was really in need of striped basic tops. The ones in my closet have literally all seen better days, so I asked for 3 yards of her, stripe jersey black/white, with intentions of making 2 long-sleeved shirts from it. I had never worked with a poly/rayon/spandex blend jersey before, but having ordered from her shop before, I trusted that the quality would be impeccable. I certainly wasn’t disappointed!!! This fabric is buttery soft with a really good weight and drape, and the stretch is good with awesome recovery. It is not nearly as stretchy as a rayon/spandex without the poly, and in my book, that is a huge improvement! I love that these tops don’t “grow” throughout the day as I wear them. They remain crisp and fit just as perfectly at the end of a long day as when I first put them on in the morning. I am also happy to report that with a pre-wash and dry, as well as a whole day of hard wearing, there is no pilling at all. This IS HUGE. All rayon/spandex fabrics that I’ve come across have pilled at least a little in the pre-wash or the first wear. Over the next week, I’ll be breaking down each top with it’s own detailed post on my blog Handmade Frenzy, but for now, I’ll go over the quick details of all the tops I made! For size reference below; my measurements are, B=35.5, W=28, H=37.25, I am 5’3” tall. I had only planned to make 2 long-sleeved tops from the yardage Tammy sent, but when it arrived, I realized that it was super wide (63 inches!) and I had plenty of fabric to work with! So to work I went, and managed to cut out these 4 tops (all with stripes matching, I might add)! The first top on my list was a classic tee. I used the Panama Tee pattern by Alina Design Co. This top is an absolute necessity in a basic wardrobe. It’s great on it’s own, but is also perfect for layering because it is fitted enough to wear under a wide array of layering pieces. I made a size 6, shortened 1/2”. I paired it here with a Hampton Jean Jacket turned vest. I blogged all about this on my blog today! Post HERE. The vest is also made with D&H Fabric, I used this amazing Italian slub denim in light indigo. It was everything I hoped for this project, I’m in love! 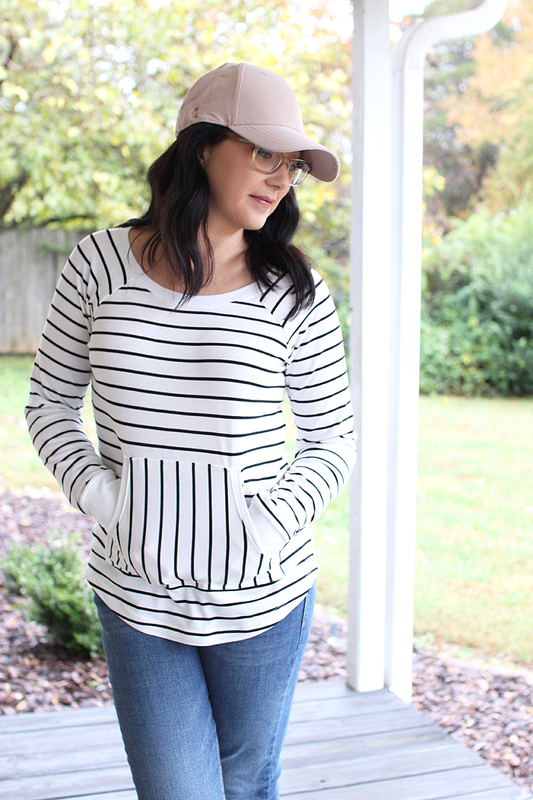 Next I cut out a Lane Raglan with a kangaroo pocket in the front for some fun stripe play. I used a plain white cotton/spandex from my stash for the neckband and cuffs. This worked in my favor, because if I had used the stripes, I’m not sure it would have worked out so perfectly! You guys, I had strings left of the yardage when I finished cutting, lol! I love how I feel in this outfit. Sporty and fun, but I felt a little Pinteresty, so a pumpkin felt like the right prop. LOL. I made a size med, shortened the length 1.5” and used the shirttail hem option I used the kangaroo pocket pattern piece from the Halifax Hoodie and just eyeballed where I wanted it to be on the shirt front pattern piece, marked, and then transferred those markings to the fabric before sewing. The third top I couldn’t get out of my head was a Mandy Boat Tee. FREE PATTERN, y’all!! I’ve been meaning to make one for ages, but was super motivated after I saw this fabric and since the pattern was recently graded to include additional sizes, it was meant to be! Plus, Tammy has it listed as a pattern possibility in the fabric description. She totally nailed it. It couldn’t be better suited to the pattern! I made a straight size 2, and the fit is perfection. I did a 5/8” hem on the bottom and the sleeves. 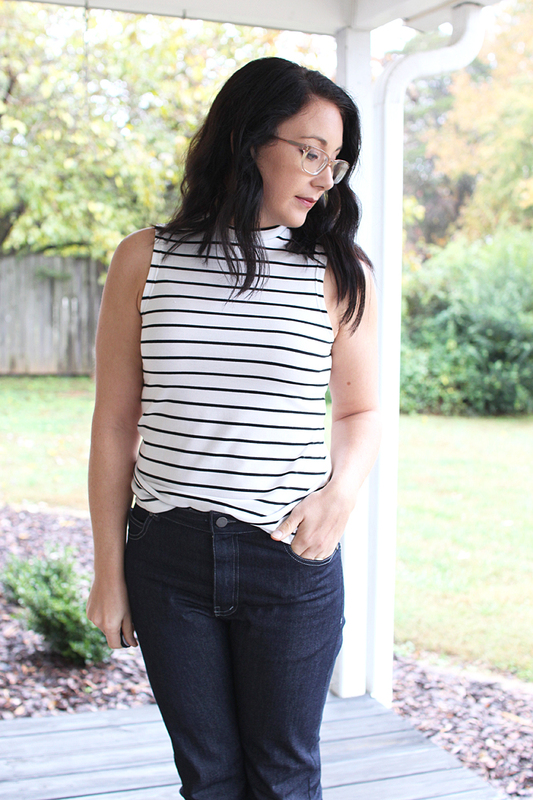 I am finding this top to be so versatile!! It looks super cute left untucked and with a cozy blanket scarf. I love mixing some prints, especially in the fall! I also love it with a little tuck at the waist, or my go-to, which is tying in a knot at the waist. This top is going to be worn all. the. time. Lastly, I knew I could just squeeze a Nikko Top from what I had left! I made a pair of Nikko Tops last fall/winter, but since I had just the right amount of fabric left, I figured I needed another one. Haha. One can never have too many Nikkos! For this version, I decided to size up one. I had intended for it to have just a little more ease that way when I cut out the pattern, but knew that with this fabric, the ease wouldn’t transfer. In fact, if you plan to make a close fitting pattern like the Nikko, which is intended for very stretchy fabrics, you will want to size up your pattern if you use this fabric. Sizing up one worked just perfectly! The slight fit changes I made, other than sizing, was to shorten by 1 inch and I reduced the height of the mock neck by half. I’ve seen some tops like this in RTW lately, and I really loved the look and wanted to try it for myself. Verdict: I love it!! The Nikko is the perfect companion to the Blackwood Cardigan as well. So that’s all of it!! 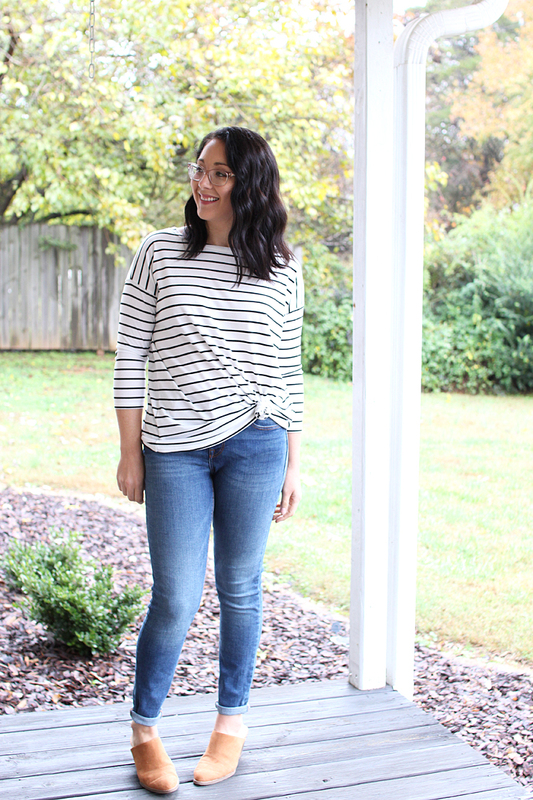 I had so much fun creating this little collection of striped basic tops for my closet! I can’t wait to style them a million different ways.